In a large bowl mix the buttermilk and egg together. In another large bowl mix all the dry ingredients together (flour, matcha, baking powder and bread soda). 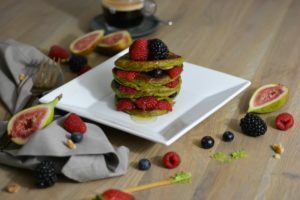 To ensure that the matcha is evenly dispersed through the flour, pass the mixture through a sieve 2 or 3 times. Add the dry ingredient mix to the buttermilk and egg, whisk until the batter is smooth with no lumps. Add vegetable oil to a non stick frying pan and set the heat to medium/high. Using a large spoon, place one spoon of batter carefully on the frying pan. Fry for 1 – 2 minutes until bubbles form on top, then flip and continue to fry on the other side for 1 – 2 minutes. 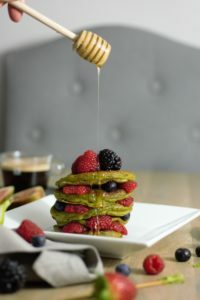 Serve on a plate along with the recommended toppings and garnish with honey or maple syrup. – Mix all the ingredients for the gyoza filling in a bowl together and set aside. – Place the gyoza skins, a clean water bowl, teaspoon and large serving dish on the counter top before you start making the dumplings. 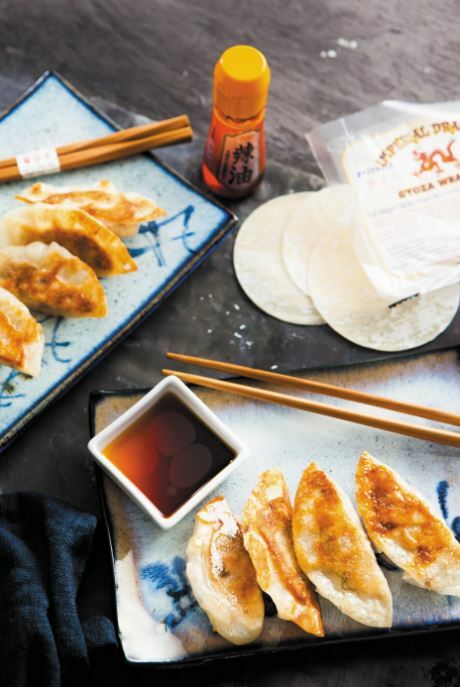 – Place a gyoza skin on the palm of your hand, take a heaped teaspoon of the filling and place it in the centre of the gyoza skin. – Moisten the edge of the upper half of the gyoza skin by dipping your finger in the bowl of water and sliding it along the edge. – Press firmly on all pleats to ensure that the ingredients are secure within the gyoza skin. Heat oil on a non-stick frying pan on medium to high heat. Place the gyoza on the pan and fry until the base of the gyoza is slightly golden. Pour cold water around the edges of the pan and cover with a lid. Leave cooking for 10 minutes or until almost all of the water has evaporated. Remove the lid and continue to fry until the water is fully absorbed. Finally, drizzle sesame oil over the gyoza and fry until the base of the gyoza is golden brown. Serve with the soy sauce and rice vinegar dipping sauce. 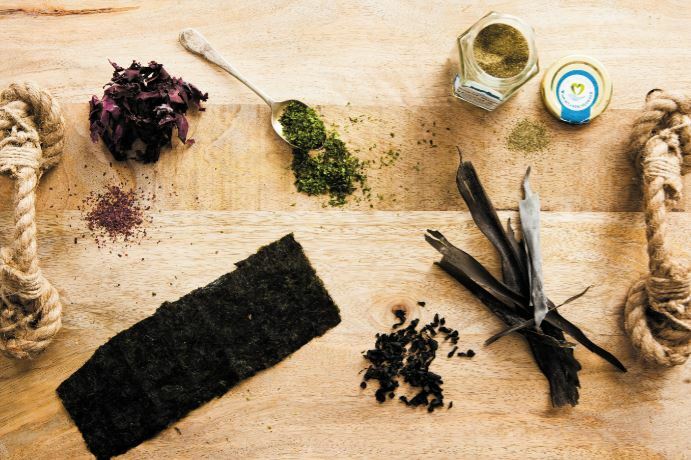 Seaweed is an important part of the Japanese diet, from sushi making to simple stocks and salads. Here is a list of the seaweeds that I regularly use for cooking and that you can find in my recipes. It’s filled with umami (the fifth taste) and one of the main ingredients used to make Japanese cooking stock (dashi). It’s also used for salads and stews. Kelp seaweed can be found along the coast of Ireland. Nori is best known outside of Japan for wrapping sushi rolls and onigiri (Japanese rice balls). Nori can be bought as roasted seaweed sheets or milled (aonori). This type of seaweed is relatively easy to find in most supermarkets. Once opened, nori sheets need to be stored in an airtight container or they will lose their crispy texture. Ao-nori (milled nori) is often sprinkled over dishes such as okonomiyaki and yakisoba just before serving. Wakame can be bought as small dried pieces. It is added to miso soup and salads. Be careful how much dried wakame you add to a dish as these tiny pieces of seaweed expand once they are in water. This is a reddish-brown seaweed that you can easily find along the coast of Ireland. It is packed with vitamins and minerals. It can be used in cooking and baking. The first thing to learn before you start cooking Japanese food at home is how to wash and cook Japanese rice properly. 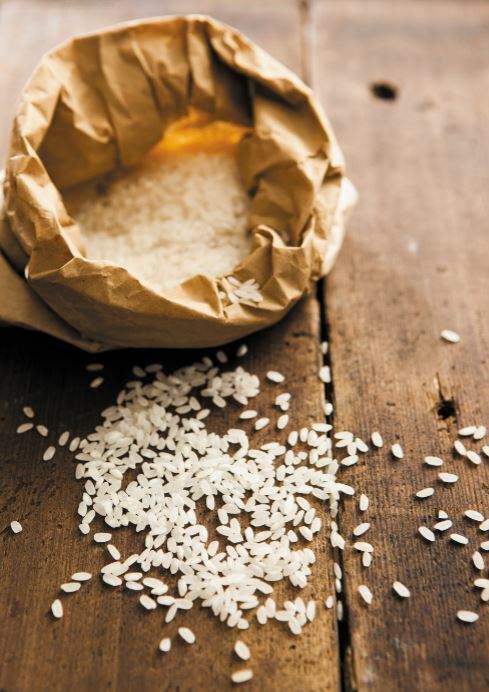 Click here to see my post on washing and cooking Japanese rice. To understand the importance of rice in the Japanese diet you only need to look at the word ‘gohan’, which means both meal and rice. A typical Japanese home-cooked meal always includes a bowl of rice accompanied by soup and several other communal dishes, including vegetables, fish and meat, to give a nutritionally balanced meal. I lived in a rural village called Nishiyama on the western coast of Japan for two years. It was surrounded by endless rice fields and mountains. There I got to truly experience the importance of rice in Japanese society. I remember one neighbour who warmly welcomed me to Nishiyama village with gifts of his own harvested rice and seasonal vegetables. I became good friends with him and his wife, and learned so much from them about Japanese food and culture. One day they brought me along to their rice field to watch their son plant rice seeds. After witnessing the hard work involved in planting, cultivating and harvesting rice, I gained a deeper appreciation for this sacred grain. At home I prefer to serve rice in small Japanese-style bowls rather than on plates, as it’s easier to control portion sizes this way. The concept of communal eating and the use of chopsticks during eating also help control the amount of food eaten during a Japanese meal, without people having to make a conscious effort to do so. 1 Put 1 litre of cold water in a large saucepan. 2 Add the kombu and shiitake mushrooms to the water and leave to soak for at least 30 minutes. If you have time leave to soak for a few hours or overnight (in this case, place in the fridge). This will fill the water with the goodness and umami from both the seaweed and the mushrooms. 3 Heat the water until it comes to the boil and then remove the kombu and mushrooms immediately. 4 This can be stored in the fridge for about 3 days, or you can freeze it. Tip This is an ideal dashi for vegetarians. Dashi is a type of cooking stock used as a base for soups and other dishes in Japanese cuisine. It is surprisingly easy to make compared to stocks here in the West. The secret to a good Japanese stock/broth is to use ingredients filled with umami – ‘the fifth taste’. 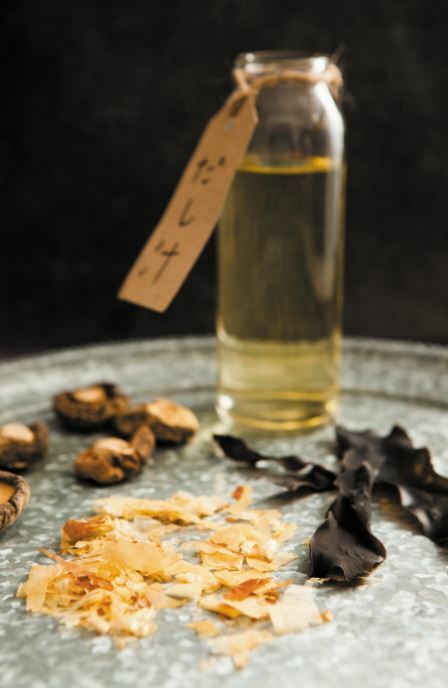 Traditionally, dried fish flakes called ‘katsuobushi’ and kelp seaweed are the basis for Japanese stock. Since katsuobushi is quite difficult to get outside Japan and expensive to buy, I tend to use kelp seaweed only or a mix of kelp seaweed and shiitake mushrooms, as these raw ingredients are also filled with umami and are widely available. We have an abundance of kelp seaweed here in Ireland, which can be bought in health stores, large supermarkets and fishmongers, so Ireland really is the ideal place to make dashi! Instant stock (also called instant dashi) is a dry ingredient that comes in granules and can be used to replace home-made dashi. Using instant dashi in Japanese cooking is similar to using stock cubes for cooking here in the West. Outside Japan it can be difficult to source so, depending on where you live, it may be easier to make home-made dashi. The most popular type of instant dashi granules available is called ‘hon-dashi’, made by a company called Ajinomoto. To use instant dashi granules for any of the miso soup recipe add 1 teaspoon of instant dashi granules to 1 litre of water. I recommend making dashi from scratch if possible, as nothing compares to the depth of flavour in home-made dashi and you also have the comfort of knowing exactly what’s in the stock. 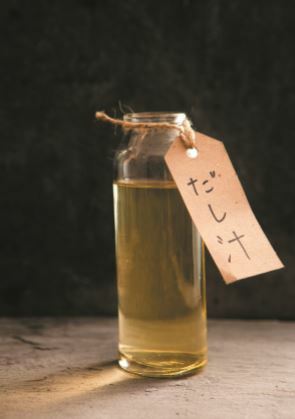 What follows are three recipes for home-made dashi.